Moving can be a stressful time, especially when it comes to choosing a moving and storage company. As anyone in the military who has undergone a Permanent Change of Station (PCS) before knows, many of these companies are often working on lowest-bid contracts. That means their only motivation is to move as many people as quickly as possible, and there’s not a lot of incentive for them to handle items with care. After experiencing one too many moves with broken and missing items at the end, many people in the military decide it’s time to try the Do It Yourself (DITY) route. 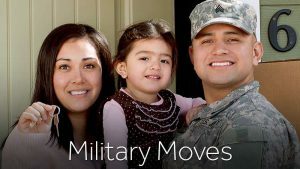 DITY moves were designed to allow members of the Armed Services to save money. By offering 90 percent off what your branch of service would have spent on moving you, the Armed Forces is able to reduce its PCS costs by 10 percent. In exchange, you get a lump sum of money to compensate you for your travel. In order to make this system work for you, you need a low-cost but reliable way to move your stuff. That’s where Zippy Shell comes in. Your move starts by ordering a Zippy Shell delivered to your driveway. If you’re in base housing, don’t worry — we can deliver a shell there too. Our shells are street legal and our drivers are trained to parallel park them in all kinds of tight spaces. That means they can go just about anywhere. If you own or rent a house off-base, we can park them in your driveway or side yard. After the Zippy Shell has been delivered, you can take up to 72 hours to load/unload the shell. You’ll know that the packing job was done right because you’ll do it yourself. You can ensure that nothing is lost, broken or stolen. As soon as you’re finished packing your Zippy Shell, our driver can move it to the location that you specify. If you are moving across the country or down the street, Zippy Shell can handle it. We can even take your Zippy Shell to one of our secure holding facilities if you need to wait a few days, weeks or months before receiving your goods. Our holding facilities are air conditioned, so don’t worry about your electronics and other items baking in the sun or freezing in a parking lot. We move your Zippy Shell as one complete, contained unit; you don’t have to worry about your goods being loaded and unloaded into multiple trucks (and getting lost along the way). After your goods arrive at your new home, you can take all the time you need to unload the Zippy Shell. Again, you can unpack over the course of a few weekends or take a couple of days of leave and get the job done. Take time to get your new house set up just right without tripping over boxes for weeks while you figure out where everything is going to go. 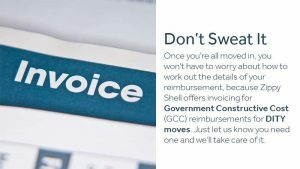 Once you’re all moved in, you won’t have to worry about how to work out the details of your reimbursement, because Zippy Shell offers invoicing for Government Constructive Cost (GCC) reimbursements for DITY moves. Just let us know you need one and we’ll take care of it. Smaller size: It’s a 8 ft. container (7 ft. high, 7 ft. wide and 8 ft. long) with 50 square feet of space. It can comfortably hold 2-3 furnished rooms worth of furniture and boxes. Larger size: It’s a 15 ft. container (7 ft. high, 7 ft. wide and 15 ft. long) with 100 square feet. It can comfortably hold 3-4 furnished rooms of furniture and boxes. Convenient and affordable storage solutions are our way of giving back to the men and women that serve and protect. Our shell system will save you time and takes half the effort of traditional storage, allowing you to make the most of your military leave. Like with our moving services, we’ll deliver a Zippy Shell storage container to your home, which you will pack with all the items you need to store. One of our drivers will then pick it up and take it back to be stored until you are ready to unload it. When you are ready to unload your shell, you just have to give us a call and we will deliver your belongings at your convenience. Contact us today to find out more about our military discounts and services or to request a free quote.